This Made in the USA ergonomic stool encourages you to make small movements that help circulation, breathing, and keeping your mind more alert. And unlike a stability ball, ErgoErgo looks cool and won’t roll away. Ages 10 and up. Original holds up to 200 lbs., Wide holds up to 275 lbs. Weight: Original: 9 lbs. ; Wide: 12 lbs. I bought a kids size stool this past December for my classroom. I thought I would at least give it a try, and for the last 2 months, it has been a life saver! It has made such a difference for my student who just could not sit in a regular seat. Now sits and does work while still being able to move. I really like this seat. Just the right height for my table and very comfortable. Great for helping balance and posture. I love my new ErgoErgo sitting stool! comfortable, sturdy, well priced and good looking. This Made in the USA ergonomic stool keeps you active while sitting. It’s shaped like an accordion to encourage small movements, use your muscles, and reduce slouching. By staying active, you boost your strength and flexibility. ErgoErgo challenges you to stay in an alert, upright position that helps your circulation, your breathing, and even your focus. Traditional chairs give your core and back muscles a lot of support, which is why you tend to slouch. That causes the muscles to weaken and creates discomfort in your shoulders, neck, and back. With ErgoErgo, you’re shifting through a range of small movements as you sit, strengthening, your body. 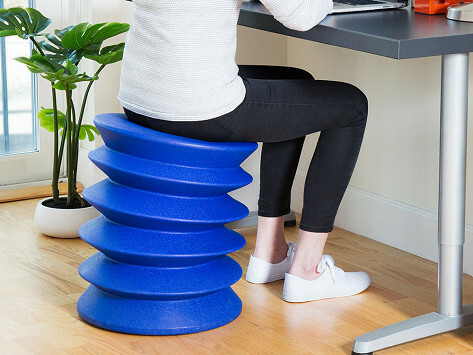 And unlike traditional stability balls, this stool won’t roll away when you get up. 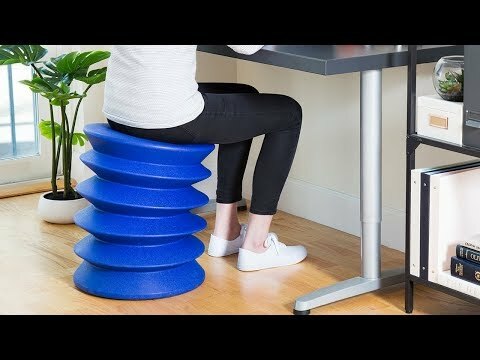 It’s a more active, healthier, cool-looking way to spend your time sitting down.